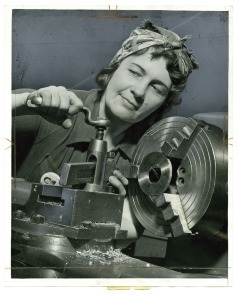 Grandma takes a hand at operating an engine lathe at Cramp's Shipyard and thinks the work is "wonderful!" She's Mrs. Mary E. Gibson, of Maple Shade, NJ, mother of seven children and has an 18-month-old grandson, Douglas. Delighted with the fact that women are doing so much for their country during this warn, she is glad to contribute her share. She works from 4 PM to midnight.